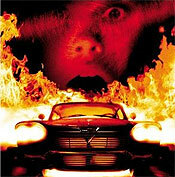 Stephen King’s hellbent ’58 Plymouth Fury, Christine, is back in the shop for some modern retooling, no secret there. However, who are the creative mechanics working under the hood? Word trickled over to us that Disturbia co-writer Christopher Landon may be flirting with the project. In talking with him one-on-one about his latest Dreamworks thriller (he shares screenwriting credit with Carl Ellsworth), Landon was hesitant to delve deep into the subject of a Christine remake, but he did confirm his possible involvement. Fair enough. King’s original 1983 novel was turned into a John Carpenter film that same year starring John Stockwell (director of Turistas), Keith Gordon (“Dexter”) and Alexandra Paul (“Baywatch”). Not long ago, a remake of the film was announced along with an update of King’s Pet Sematary. Look for more Disturbia coverage as we near its April 13th release and keep an eye out for ComingSoon.net’s horror division, ShockTillYouDrop.com, to launch around that ominous date!